Prices in Germany are normally 75% below the cost for Dynamic Spine Stabilization in the US and are individually quoted. They include all medical expenses, the hospital stay, surgeon's fees, operation room fees, anesthesia, anesthesiologist's fees, medicine, nursing, semi-private room, meals, pre-op diagnosis, local phone and English TV. Dynamic spine stabilization is a surgical procedure which is being practiced by neurosurgeons in Germany and now other parts of the world. 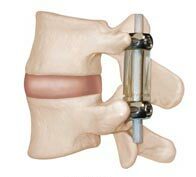 Dynamic spine stabilization involves implantation with pedicle screws of devices which has external spacers attached to either side of the affected vertebra. This is a posterior approach to spine stabilization and does not involve the disc, even though degenerative disc disease is major reason for this procedure. With dynamic spine stabilization stabilization of the vetebrae is achieved while leaving the spine itself intact. Because of the flexibility of the materials in the device the spine can still bend straighten or twist within new limits. The Isobar, Stabilimax NZ, Dynamic Soft Stabilization System and Dynesys devices are have implants for this procedure today.